POPPY IS SWINGING IN LONDON! ARE YOU READY FOR A GROOVY OL’ TIME? This season, Poppy Parker has traveled to jolly ol’ England for a fashion trip like no other… welcome to the Swinging London Collection! Poppy Parker can’t believe that she’s almost a month into her tour of swinging London and she’s just now getting some downtime to go sightseeing. Poppy adores the fact the British press have dubbed her “Popster” and loves interacting with her fans in public, but it sure would be nice to see Big Ben without all of the blinding flashbulbs going off! Poppy Parker is a fully articulated 12.5 inch doll with fully rooted hair and hand applied eyelashes. For her day off in London, Poppy wears a smart green and white mini dress with faux leather details, green and white matching shoes, a purse and faux white leather outback hat complete this kicky look! Poppy has arrived in London and she’s so excited to see the debut collection of her clothing line, “Poppy Gear”. She’s having fun trying on and modeling a few of the new dresses from the collection. She’ll be the focus of the ad campaign, modeling the dresses. This totally groovy gift set features a fabulously youthful rendition of Poppy Parker, which features fully rooted hair and delicately hand-applied eyelashes. Poppy comes with three ultra-colorful mini-dresses, three pairs of shoes and all sorts of fun little mix-and-match fashion accessories to create many fun looks! It comes in a brand new Mod-themed collector package that you won’t want to miss! oppy Parker’s Swinging London trip is coming to an end and while she still has one more fashion show to do before she heads back to New York, her friends at the London agency invited her at a very “Mod” holiday party to ring-in the new year ahead! But, what’s a girl to wear for such a groovy event? Poppy decided to go gold and she’s glad that she did; the fabulous Mod Holiday Tree that decorated the hall felt like it was just waiting for her to arrive! Poppy Parker is a total feast for the eyes this holiday with her golden threads! 12-inches tall and completely articulated, Poppy has lush, fully rooted hair and delicately hand-applied eyelashes! Dressed elegantly to ring-in the new year in her own unique Mod way, our favorite teenage model wears a slim-fit, floor length white and gold gown, complimented by long triangular chandelier earrings that perfectly match the “pyramid” pattern on her dress. Poppy also comes with elegant open-toe heels, three bracelets, a golden clutch purse and three holiday gift boxes for her friends! Who else knows how to celebrate the holidays with a totally unique holiday tree? Poppy Parker of course!! The perfect height to fit inside your doll display cabinet, this fun tree will add an elegant touch to your collection and features Poppy’s initials, snowflakes and other fun little treats! It’s a perfect memento of the year Poppy Parker celebrated the holidays in London with her fashionable British friends! While in London Poppy was asked to be a special guest star on a few episodes of her favorite British Spooky TV series, “Misty Hollows”. This was quite an honor, as she had been watching this show back home even before it became cool to do so! Poppy Parker is dressed perfectly to play the part of the “spooked out” neighbor in this classic British TV series! This absolutely stunning edition of everyone’s favorite teenage model comes dressed in a fashionable Victorian inspired Mod dress, complete with lace cravate and matching ribbon in her hair. Since we couldn’t leave our girl in the dark, Poppy also comes with a super detailed miniature candle and holder*, perfect to shine some light on the mystery surrounding the plot she stars in! Poppy is in London and she’d like a Carnaby Street makeover. She hits some of the most popular London boutiques like “Sign of the Times” and gets her hair and makeup done at the grooviest salon in London… Sid Vasoon. Newly arrived from her modeling stint in Paris, Poppy knows it’s time for a new look and this gift set totally delivers! Here you get not one, but two fabulous Poppy Parker dolls in the same super fun collector friendly package, showing Poppy upon her arrival to London from Paris and then post her sleek Mod makeover! Each fully rooted and articulated doll features very distinctive looks, designed to illustrate Poppy’s passage to a new evolution of her look as a “Mod”ern teen idol! Poppy is on a photoshoot in the streets on a rainy day for makeup company Miss London promoting their new line of lipsticks called Sunny Slickers. 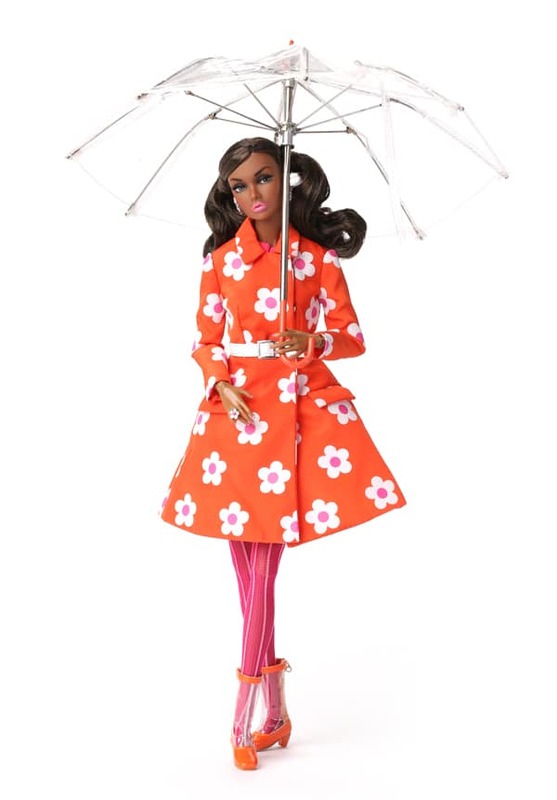 Dressed in super vibrant colors to really bring out her lovely features, Poppy puts some pop in her step in a totally groovy rendition of the traditional rain coat. Set to stay perfectly dry on any rainy day, Poppy’s colorful look could bring a ray of light on any dull and dreary rainy day! Comes complete with adorable clear vinyl boots and a fully functional clear vinyl miniature umbrella. On a day off from work, Poppy has decided to take in another day of sightseeing “Downtown”. With her brand-new 35mm portable camera in tow, Poppy will soon be in awe of all the incredible sites and attractions the city has to offer! Poppy is a fully articulated doll with fully rooted hair and hand applied eyelashes. Perfectly clad in her super modern pastel tweed suit, Poppy is set to take London by storm; she just wants to see it all and not miss a beat! Poppy Parker is ready for her British Invasion in this super cute Union Jack mini-dress! With her fiery, fully rooted hair, ultra MOD faux leather scooter (or racing) coat, bobby hat and bright white knee-high laced boots, Poppy is ready to lead the march to London’s most fashionable spots! Poppy also comes with a matching jewelry set, a purse and three souvenir pillows that she kept from the official photo shoot, just so she can make her brand new egg chair pop with color!